Tofu Matar Masala, A delicious vegan curry. 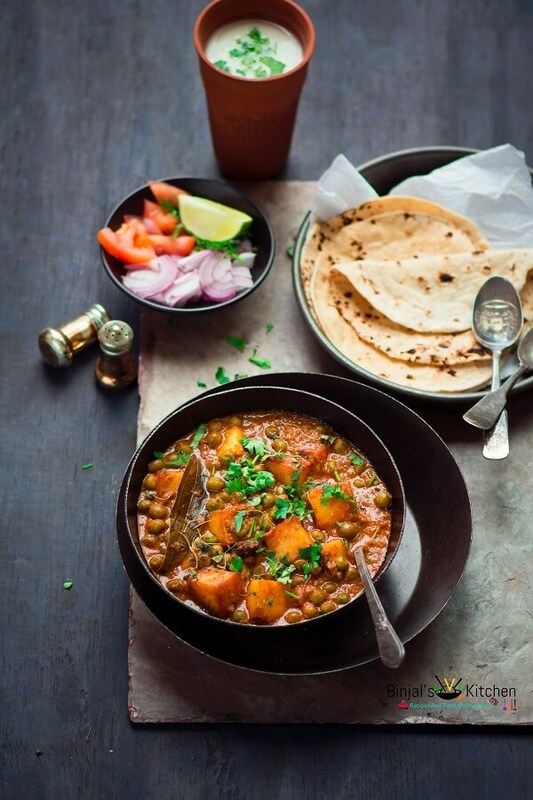 Tofu Matar Masala is very similar to popular north Indian Matar Paneer Curry. Tofu Matar Masala is healthy too. Tofu is a healthy alternative of Paneer for vegan. It is shallow fried tofu cubes and green peas are simmered in spicy onion-tomato gravy. 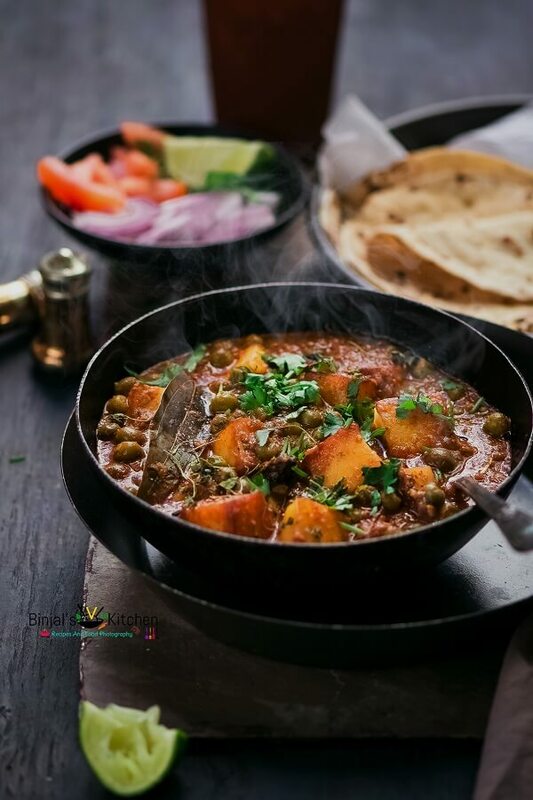 Matar Paneer Curry is very popular North Indian recipe that you can find it in almost all restaurant menu, also used frequently in North Indian kitchens. But, it’s a very difficult to for vegan people, so tofu is perfect substitute of paneer for vegan people. Nowadays, some restaurants are serving vegan options curry too but it’s very few. Paneer and Tofu both are high in protein foods, often opted by vegetarians for protein intake. Tofu is a soy cheese whereas Paneer is a milk cheese. Paneer is always sold fresh, whereas tofu can be sold processed. Tofu is a type of food that is formed by coagulating soy milk whereas, paneer is prepared by curdling milk with food acids such as lemon juice, vinegar. Paneer is high on fat, whereas fat content in tofu is quite low. Tofu has more health benefits than Paneer as it is low on calorie count while being high on proteins. 1. Take a kadhai or deep pan. Add oil, tofu and shallow fry it till becomes light brown, remove it and keep aside. 2. In the same pan add oil/butter for gravy. Add ginger, minced garlic, chopped green chili, cashew nuts and sauté it for few seconds. Add chopped onion and stir fry it till becomes golden brown on low to medium flame. 3. Now add chopped tomatoes and sauté it on medium flame till becomes soft and mushy, switch of the flame and let it cool down. 4. Once the saluted mixture is cooled down add into the blender or mixer jar and blend it till smooth soft paste for gravy. 6. Add ¾ cup water and cook it till boiling point. Add fresh or frozen green peas, shallow fried tofu and salt. Mix it, cover it and cook it for 3-4 mins on medium flame. 8. Add crushed kasuri methi and chopped coriander leaves. 9. Tofu Paneer Masala is ready to serve with roti, paratha or naan and enjoy the meal. • You can add tofu cubes directly into the curry without shallow frying its. Tofu Matar Masala, A delicious vegan curry. Tofu Matar Masala is very similar to popular north Indian Matar Paneer Curry. Tofu is a healthy alternative of Paneer for vegan. It is shallow fried tofu cubes and green peas are simmered in spicy onion-tomato gravy. 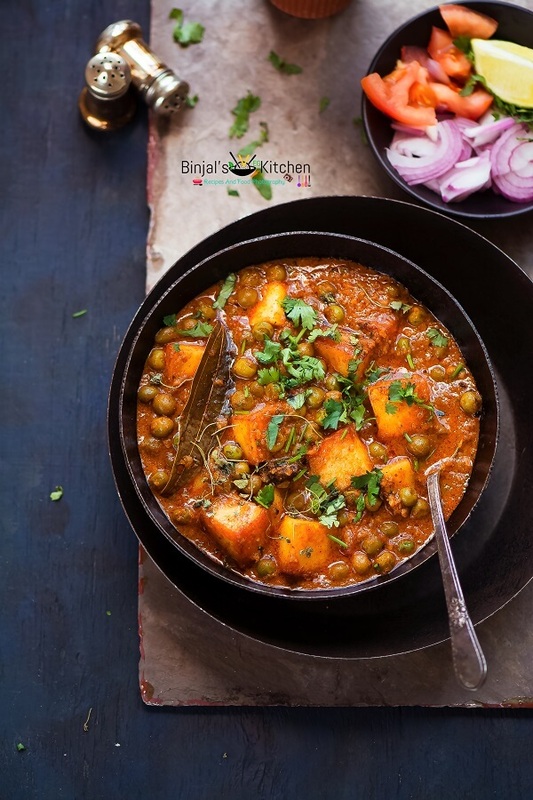 Matar Paneer Curry is very popular North Indian recipe that you can find it in almost all restaurant menu, also used frequently in North Indian kitchens. But, it’s a very difficult to for vegan people, so tofu is perfect substitute of paneer for vegan people. Nowadays, some restaurants are serving vegan options curry too but it’s very few. Take a kadhai or deep pan. Add oil, tofu and shallow fry it till becomes light brown, remove it and keep aside. In the same pan add oil/butter for gravy. Add ginger, minced garlic, chopped green chili, cashew nuts and sauté it for few seconds. Add chopped onion and stir fry it till becomes golden brown on low to medium flame. Add ¾ cup water and cook it till boiling point. Add fresh or frozen green peas, shallow fried tofu and salt. Mix it, cover it and cook it for 3-4 mins on medium flame. Add crushed kasuri methi and chopped coriander leaves. Tofu Paneer Masala is ready to serve with roti, paratha or naan and enjoy the meal.